There’s no doubt that these events have an impact. On the other hand, luck should even out over time… right? To investigate these different aspects of luck, I created a dataset made up of several hundred public ESPN fantasy football leagues from the 2012 season. The final dataset contains 797 ESPN fantasy leagues and the drafts for each, and covers 7,970 teams, 51,805 games played, and 410 NFL players from the 2012 season. This large sample size can help us understand which aspects of luck wash out when averaged over hundreds of leagues and thousands of games, and which truly represent systemic disadvantages. In this post, let’s start with one of the earliest opportunities for luck to impact your season, and examine the impact of random draft order assignment. And here’s the short answer — even when looking across hundreds of leagues, on average, players that draft later score fewer points than players that draft earlier. Why does this happen? And what can you do you about it? HOW MUCH DOES DRAFT POSITION IMPACT OUTCOMES? The first place to start was to simply see if there’s a relationship between draft position and points scored. After all, the purpose of a Snake-style draft (where players select in order from #1 through #10, then #10 back to #1 again) is that draft order should wash out over time. So does it? Let’s take a look at the average points scored per season by people who drafted #1 vs #2 vs etc. in 10-team leagues. 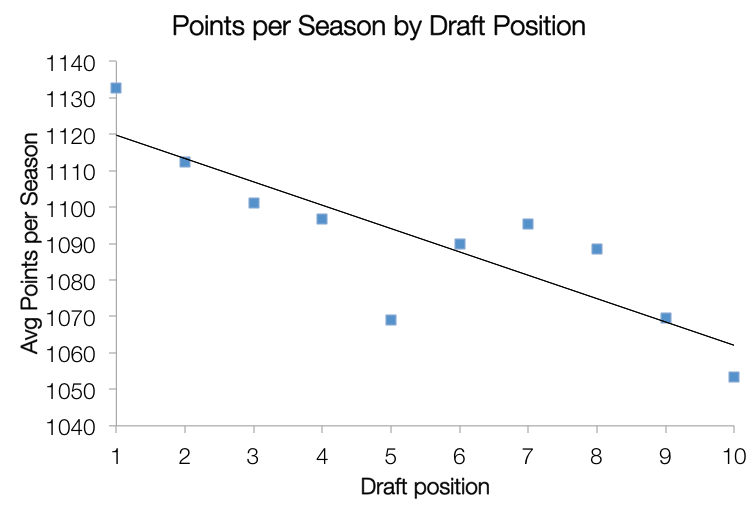 Unfortunately for late drafters, on average the earlier you drafted the more points you scored that season, and the later you drafted the fewer points you scored. And since the impact of draft order is strongest earlier in the season, before injuries, trades, and breakout players introduce more parity, these points aren’t spread equally. This relationship was likely frontloaded to the start of the season, and thus could play a role in tipping early games. SO WHY DOES DRAFT POSITION MATTER? There’s two reasons this might be happening. Possible reason #1: Early drafters get the superstar players in the league, all other variations wash out, and these single players alone end up overwhelming lower drafters’ players. Possible reason #2: Early drafters get somewhat better players at a few positions, and the cumulative effect adds up. Let’s start with the first hypothesis: that early drafters get the highest-scoring players. Looking at the data below, it seems that draft order doesn’t really have much of an impact on who gets those superstars. Below are the top-scoring players for the season (remember, this was the 2012 season), and the percentage of time that they went to the player that drafted 1st vs the player that drafted 2nd, etc. The bolder the blue, the more often the player went to someone in that position. In practice, the impact of luck on getting one of the superstar players really does wash out. Outperforming players such as Adrian Peterson (coming off an ACL tear in 2011) and breakout rookies like Andrew Luck meant that in 2012, the top-performing players ended up being spread pretty well across draft positions. Note that Andrew Luck, in particular, went entirely undrafted in over a third of leagues in his rookie year. So it’s not as though lower draft pickers aren’t getting excellent players. Rather, the discrepancy is more simple, more systemic, and related to the players drafted at each position. 1.) Early drafters get better players specifically at the running back position, and 2.) this advantage carries out throughout the course of the season. To make this more visible, I’ve assigned two “likelihood scores” to each running back each week. 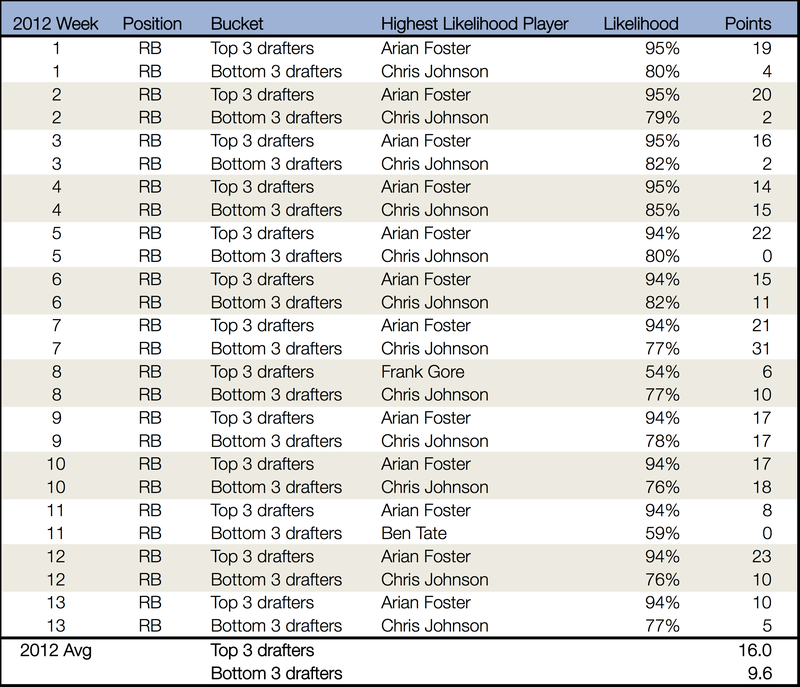 One identifies how likely the running back was to be started by someone who drafted 1st, 2nd, or 3rd (“Likelihood score among Top 3 drafters”) , and the other identifies how likely the running back was to be started by players that drafted 8th, 9th, or 10th (“Likelihood score among Bottom 3 drafters”). This score helps us find the RBs most “correlated” with being started by a Top 3 drafter or by a Bottom 3 drafter, so we can more easily identify common patterns. Let’s extend this score to all players, and find the average points scored per week by Top 3 starters and Bottom 3 starters (weighted by each player’s likelihood score that week), over the course of the season. This gives us, conceptually, an “expected value” of a player at each position for a Top 3 drafter vs a Bottom 3 drafter. 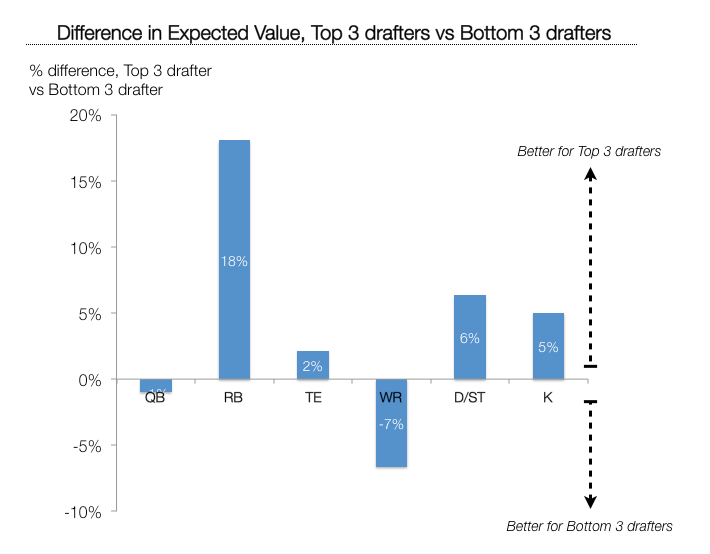 By comparing the differences in expected value, we can see where the advantages to early drafters are the largest. Over the course of the season, early drafters have an advantage at the RB position over late drafters. To make up this edge, lower drafters need to be seeking out some kind of advantage in other skill positions. Unfortunately, other positions show little or no variation between top and bottom drafters, meaning they leave little room to make up that ground. So what can a late drafter do about this? Well, the most obvious advice is to change the league’s rules so that draft order is assigned based on, say, reverse order of last-year’s standings. Barring that? The options are limited. If the order has already been assigned, you need to be thinking Moneyball-style. You’re the Oakland A’s competing with the New York Yankees, you need to pick up advantages wherever you can. And who are the fat, slow, walk-drawing batters of fantasy football? Well, there’s a FF axiom that “Defenses and Kickers don’t matter”. I’d beg to differ — Defenses and Kickers don’t matter unless you have a poor draft position, in which case they could matter quite a great deal. After all, those are the only positions where you don’t have a systemic disadvantage (as we saw in RBs) or where, on average, edges wash away due to the best talent being evenly distributed through all draft picks (like QB, TE, or WR). Drafting good Defenses and Kickers is tough, since those positions aren’t as predictable season-to-season (or even game to game) as other positions. That means that you really need to put some extra effort into it, hoping that this time, luck actually turns your way. Take your Defense and Kicker selections seriously. Draft the best — and if possible, overdraft and take more than one. Put more effort into your week-to-week Defense and Kicking selections than you might otherwise — and more than everyone else is — especially the first few weeks of the season. Finally if all else fails, just remember… it’s not your fault. This entry was posted in analysis, fantasyfootball. Bookmark the permalink.